湖泊科学 2016, Vol. 28 Issue (1): 187-194. DOI: 10.18307/2016.0122. 白友良, 吴润江, 闫长红, 王华伟, 田坤, 新疆孔雀河北岸72-51 ka BP湖相沉积物中粘土矿物特征. 湖泊科学, 2016, 28(1): 187-194. DOI: 10.18307/2016.0122. BAI Youliang, WU Runjiang, YAN Changhong, WANG Huawei, TIAN Kun. 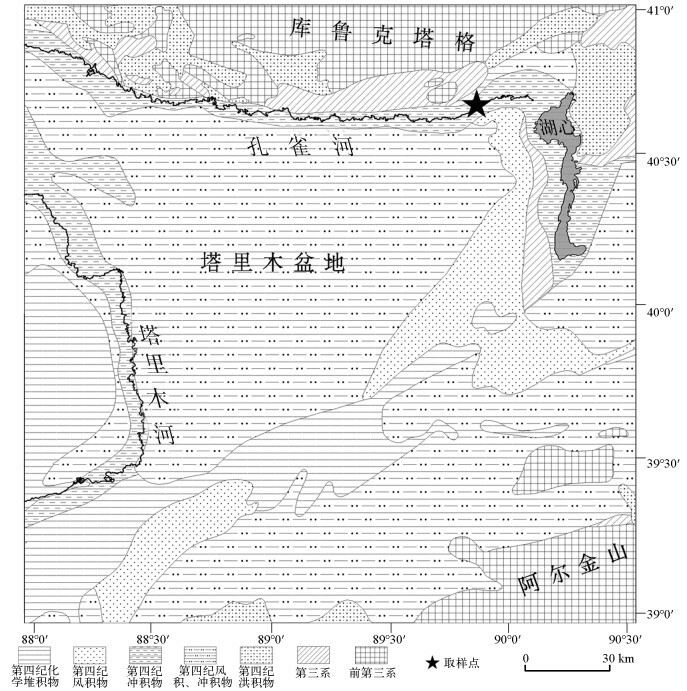 Characteristics of the clay mineralogy from the 72-51 ka BP lake sediments in the northern margin of the Peacock River, Xinjiang. Journal of Lake Sciences, 2016, 28(1): 187-194. DOI: 10.18307/2016.0122. 作者简介：白友良(1980~), 男, 硕士, 工程师; E-mail:baiyouliang008@126.com. 摘要：对新疆孔雀河北岸LX02剖面湖相沉积物开展光释光和粘土矿物样品X射线衍射分析, 根据样品中的粘土矿物成分及质量分数对本区古气候演化进行了探讨.结果显示, 该剖面湖相沉积自72 ka BP延续到51 ka BP.这期间, 研究区粘土矿物以伊利石占绝对优势(56%~64%, 平均为61%), 其它粘土矿物有绿泥石(18%~26%, 平均为22%)、高岭石(7%~12%, 平均为8%)和伊/蒙混层(5%~15%, 平均为9%), 这与塔里木盆地粘土矿物组成颇为一致.具体来说, 72.466.8 ka BP, 伊利石和绿泥石含量之和较高, 同时绿泥石含量较高, 对于高岭石而言, 除了一个样品外, 其它样品的平均值较低, 伊/蒙混层含量较低, 指示该时段为冷干气候环境; 66.856.1 ka BP, 伊利石和绿泥石含量之和最低, 同时绿泥石含量亦最低, 高岭石、伊/蒙混层含量较高, 指示该时段为暖湿气候环境; 56.151.0 ka BP, 伊利石和绿泥石含量之和增大, 同时绿泥石含量亦增大, 高岭石、伊/蒙混层含量较低, 指示该时段为较冷干气候环境.这与孢粉植物群、地球化学元素含量及其主成分F1和粒度、色度及碳酸盐主成分F1'所反映的古气候特征及其变化一致, 亦与柴达木盆地东部介形类丰度特征研究、柴达木盆地东部古湖泊高湖面光释光年代学研究、北京平原区有机碳同位素研究等结果吻合较好.研究表明塔里木盆地东部晚更新世气候仍以暖湿-冷干气候变化模式为主. Abstract: In this study, a 5.4-m-thick section of lake sediment was discovered from a LX02 profile in the northern margin of the Peacock River in Northwestern China. It is located at Tarim town (89°55'E, 40°40'N), Yuli County, eastern Xinjiang Province. From the upper to bottom, six ages of the Optically Stimulated Luminescence (OSL) samples were achieved, dated in 53.1±4.4 ka BP at 0.18 m, 56.1±3.2 ka BP at 1.19 m, 57.9±3.3 ka BP at 2.21 m, 60.5±4.0 ka BP at 3.10 m, 67.0±6.0 ka BP at 3.71 m, and 71.0±3.6 ka BP at 4.69 m, respectively. These suggest that this section spans Late-Pleistocene interval during 72-51 ka BP and establishes a reliable chronological framework for the LX02 section. Meanwhile, 18 clay mineral samples collected from the section were examined by the XRD. On the whole, illite is the dominant clay minerals, ranging from 56% to 64% in abundance with an average of 61%. Chlorite is the less dominant, fluctuating between 18% and 26% in abundance and averaging to 22%. Kaolinite ranged from 7% to 12% in content and had a mean of 8%. A mixed-layer illite-smectite ranged from 5% to 15% in content and had a mean of 9%. The presence of these clay minerals and their content variations were well consistent with those from the Tarim region. Specifically, the section is divided into three stages:in zones Ⅰ (72.4-66.8 ka BP) the sum of illite and chlorite, chlorite was high in abundance while the Kaolinite and mixed-layer illite-smectite was usually low. In zones Ⅱ (66.8-56.1 ka BP) the sum of illite and chlorite, chlorite was low in abundance while the Kaolinite and mixed-layer illite-smectite was usually high. In zones Ⅲ (56.1-51.0 ka BP), the sum of illite and chlorite, chlorite was less high in abundance while the Kaolinite and mixed-layer illite-smectite was usually less low. These suggest that climate in the study area varied generally between dry-cold and humid-warm patterns during the Late-Pleistocene period. This mode of climate change in the study area is well correlated with the changes of weathering intensity revealed by pollen, geochemical elements. Principle components F1 and F1' of clay types are consistent well with Ostracoda abundance in the upper of Core Dacan1 located in the southeast Qaidam Basin, and also agreement with the luminescence chronology-based high lake levels of the paleolakes in eastern Qaidam Basin and with changes based on organic carbon isotopic characteristics from Beijing Plain. Nevertheless, the internal forcing mechanism for this mode of climate changes in the study area remains unclear up to now and deserves further investigation. 伴随晚新生代印度板块持续推挤亚洲板块和全球显著降温，我国内陆新疆地区因山地强烈隆升和丰富的沉积记录受到广大地学工作者越来越多的关注[1 — 4].在构造尺度上，新疆地区的古环境重建通常通过磁性地层定年建立年代地层框架[5 — 8].全新世以来新疆地区的环境研究工作多集中于考古[9 — 11]和水资源调查[12 — 15].位于新疆东南部的塔里木盆地东部地区，第四纪研究很不平衡.赵振宏等、林景星等、王永等、闫顺等、王弭力等的研究揭示了该地区第四纪的气候与环境演化，但分辨率较低.罗超、贾红娟等研究了晚更新世晚期以来的气候与环境演化.相比之下，塔里木盆地东部地区晚更新世早中期的较高分辨率的记录相对较少.这在很大程度上制约了晚更新世早中期全球气候变化在该地区响应的分析研究工作.另一方面，塔里木盆地东部地区第四纪研究主要是通过孢粉、粒度、地球化学、微体化石等环境代用指标完成，作为古气候环境研究有效手段的粘土矿物研究鲜有报道. 此外，塔里木盆地东部地区更新世以来的气候演化历史研究还存在明显的分歧.罗超等[24 — 27]通过对罗布泊CK-2钻孔湖相沉积物多指标研究显示，新疆东部气候与环境的变化与北半球高纬度紧密关联，呈现冷湿和暖干的气候特征.这样的气候特征在新疆乃至西北其他地区[28 — 30]也有较好的显示.但是，在7.0-6.0kaBP期间，塔里木盆地东部台特玛湖地区出现了相对暖湿的环境特征.同样，释光和14C年代学研究显示，罗布泊盐湖北岸和东岸普遍发育的三级湖积台地分别形成于90~130kaBP、30kaBP左右和7.0 -7.5kaBP，似乎在时间上对应深海氧同位素第5阶段、第3阶段及全新世大暖期，进而反映暖期湿度大、湖面高的气候演化模式.那么，塔里木盆地东部在更新世到底受冷湿-暖干的气候模式主宰还是受暖湿-冷干的气候模式主宰还不清楚. 综合相关分析结果显示，研究区72.4-51.0kaBP期间沉积环境比较稳定，为湖相沉积.沉积物中粘土矿物由伊利石(I)、绿泥石(CH)、高岭石(K)和伊/蒙混层(I/S)等组成，占整个剖面样品的7.9 % ~41.5 %，平均为29.9 %.其中伊利石占绝对优势(56 % ~64 %，平均为61 %)，绿泥石次之(18 % ~26 %，平均为22 %)，高岭石(7 % ~12 %，为平均8 %)和伊/蒙混层(5 % ~ 15 %，平均为9 %)含量较少(表 2).根据粘土矿物类型和含量变化特征，得出研究区粘土矿物参数变化的3个阶段(图 4).上述3个阶段的划分与该剖面沉积物中地球化学元素含量的主成分(F1)和粒度、色度及碳酸盐主成分(F1′)所揭示的结果一致(图 4). 阶段Ⅰ (3个样品，72.4-66.8kaBP)粘土矿物以伊利石和绿泥石为主，含有少量的伊/蒙混层和高岭石，不含其它粘土矿物.其中伊利石占绝对优势，含量为56 % ~60 %，平均为58 %；其次为绿泥石，含量为23 % ~ 26 %，平均为25 %；伊/蒙混层含量为5 % ~9 %，平均为7 %；高岭石含量为7 % ~12 %，平均为9 %；伊利石和绿泥石的含量为82 % ~85 %，平均为83 %.对应于F1和F1′分别为-0.57729和-0.46852. 阶段Ⅱ (9个样品，66.8-56.1kaBP)粘土矿物以伊利石和绿泥石为主，含有少量的伊/蒙混层和高岭石，不含其它粘土矿物.其中伊利石占绝对优势，含量为58 % ~63 %，平均为61 %；其次为绿泥石，含量为18 % ~ 23 %，平均为20 %；伊/蒙混层含量为8 % ~15 %，平均为11 %；高岭石含量为7 % ~10 %，平均为9 %；伊利石和绿泥石的含量为78 % ~83 %，平均为81 %.对应于F1和F1′分别为0.42772和0.37514. 阶段Ⅲ (6个样品，56.1-51.0 kaBP)粘土矿物以伊利石和绿泥石为主，含有少量的伊/蒙混层和高岭石，不含其它粘土矿物.其中伊利石占绝对优势，含量为57 % ~64 %，平均为61 %；其次为绿泥石，含量为21 % ~ 25 %，平均为23 %；伊/蒙混层含量为5 % ~11 %，平均为7 %；高岭石含量为8 % ~9 %，平均为8 %；伊利石和绿泥石的含量为81 % ~87 %，平均为84 %.对应于F1和F1′分别为0.02378和-0.30747. 孙继敏, 朱日祥. 天山北麓晚新生代沉积及其新构造与古环境指示意义. 第四纪研究, 2006, 26(1): 14-19. 李有利, 司苏沛, 吕胜华等. 构造运动和气候变化对天山北麓奎屯河阶地发育的影响作用. 第四纪研究, 2012, 32(5): 880-890. 吕红华, 李有利. 天山北麓活动背斜带的变形特征. 第四纪研究, 2010, 30(5): 1003-1011. 杨海军, 李曰俊, 师骏等. 南天山晚新生代褶皱冲断带构造特征. 第四纪研究, 2010, 30(5): 1030-1043. Tang ZH, Ding ZL, White P et al. Late Cenozoic central Asian drying inferred from a palynological recond from the northern Tian Shan. Earth and Planetary Science Letters, 2011, 302(3/4): 439-447. 陈杰, Heemance RV, Burbank DW等. 中国西南天山西域砾岩的磁性地层年代与地质意义. 第四纪研究, 2007, 27(4): 576-587. 吕红华, 李有利, 刘运明等. 新疆塔西河地区8Ma以来沉积环境演化及其构造意义. 第四纪研究, 2008, 28(2): 243-252. 陈杰, 卢演俦, 丁国瑜. 塔里木西缘晚新生代造山过程的记录-磨拉石建造及生长地层和生长不整合. 第四纪研究, 2001, 21(6): 528-539. 吕厚远, 夏训诚, 刘嘉麒等. 罗布泊新发现古城与5个考古遗址的年代学初步研究. 科学通报, 2010, 55(3): 237-245. 赵克良, 李小强, 周新郢等. 新疆新塔拉遗址农业活动特征及其影响的植物指标记录. 第四纪研究, 2012, 32(2): 219-225. 李保国, 马黎春, 蒋平安等. 罗布泊"大耳朵"干盐湖区地形特征与干涸时间讨论. 科学通报, 2008, 53(3): 327-334. 樊自立, 艾里西尔·库尔班, 徐海量等. 塔里木河的变迁与罗布泊的演化. 第四纪研究, 2009, 29(2): 232-240. 李忠勤, 李开明, 王林. 新疆冰川近期变化及其对水资源的影响研究. 第四纪研究, 2010, 30(1): 96-106. 吴敬禄, 曾海鳌, 马龙等. 新疆主要湖泊水资源及近期变化分析. 第四纪研究, 2012, 32(1): 142-150. 赵振宏, 候光才, 齐万秋等. 浅谈新疆罗布泊地区第四纪下限. 干旱区地理, 2001, 24(2): 130-135. 林景星, 张静, 剧远景等. 罗布泊地区第四纪岩石地层、磁性地层和气候地层. 地层学杂志, 2005, 29(4): 317-322. 王永, 赵振宏, 林景星. 罗布泊AK1孔沉积物地球化学组成与古气候. 地球学报, 2004, 25(6): 653-658. 闫顺, 穆桂金, 许英勤等. 新疆罗布泊地区第四纪环境演变. 地理学报, 1998, 53(4): 332-340. 王弭力, 刘成林, 焦鹏程等. 罗布泊盐湖钾盐资源. 北京: 地质出版社, 2001, 27-70. 罗超. 新疆罗布泊地区末次冰期晚期的环境变化及其对全球变化的响应[学位论文]. 合肥: 中国科学技术大学, 2008. 贾红娟, 秦小光, 刘嘉麒. 楼兰佛塔剖面10.84 ka B. P.以来的环境变迁. 第四纪研究, 2010, 30(1): 175-184. Solotchina EP, Prokopenko AA, Kuzmin MI et al. 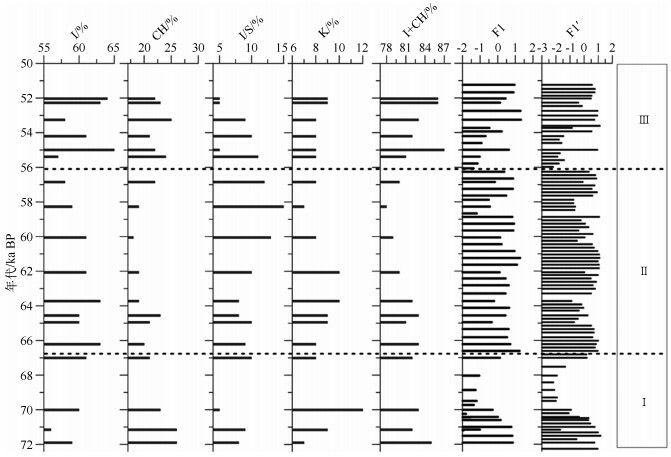 Climate signals in sediment mineralogy of Lake Baikal and Lake Hovsgol during the LGM-Holocene transition and the 1-Ma carbonate record from the HDP-04 drill core. Quaternary International, 2009, 205(1/2): 38-52. 罗超, 杨东, 彭子成等. 新疆罗布泊地区近3.2万年沉积物的气候环境记录. 第四纪研究, 2007, 27(1): 114-121. 罗超, 彭子成, 刘卫国等. 新仙女木事件在罗布泊湖相沉积物中的记录. 地球科学-中国地质大学学报, 2008, 33(2): 190-196. 罗超, 刘卫国, 彭子成等. 新疆罗北洼地湖相沉积物有机碳同位素的变化序列及其古环境意义. 第四纪研究, 2008, 28(4): 621-628. 李吉均. 中国西北地区晚更新世以来环境变迁模式. 第四纪研究, 1990(3): 197-204. 闫顺, 李树峰, 孔昭宸等. 乌鲁木齐东道海子剖面的孢粉分析及其反映的环境变化. 第四纪研究, 2004, 24(4): 463-468. 钟巍, 舒强, 熊黑钢. 塔里木盆地南缘尼雅剖面的孢粉组合与环境. 地理研究, 2001, 20(1): 91-95. 钟巍, 吐尔逊, 克依木等. 塔里木盆地东部台特玛湖近25.0 ka BP以来的气候与环境变化. 干旱区地理, 2005, 28(2): 183-187. 王富葆, 马春梅, 夏训诚等. 罗布泊地区自然环境演变及其对全球变化的响应. 第四纪研究, 2008, 28(1): 150-153. 冯晓华, 阎顺, 倪健. 基于孢粉的新疆全新世植被重建. 第四纪研究, 2012, 32(2): 304-317. 夏训诚. 中国罗布泊. 北京: 科学出版社, 2007, 20-54. 中华人民共和国石油天然气行业标准SY/T 51631995. 沉积岩粘土矿物相对含量X射线衍射分析方法. 北京: 石油工业出版社, 1995. 白友良. 罗布泊西北缘72. 4~51. 0 ka B. P. 气候与环境变化[学位论文]. 兰州: 兰州大学, 2013. Chamley H, Robert C, Muller DW. The clay mineralogical record of the last 10 million years off northeastern Australia. Proceedings of the Ocean Drilling Program, 1993, 133: 461-470. 洪汉烈. 粘土矿物古气候意义研究的现状与展望. 地质科技情报, 2010, 29(1): 1-8. Jain M, Andon SK. Quaternary alluvial stratigraphy and palaeoclimatic reconstruction at the Thar margin. Current Science, 2003, 84(8): 1048-1055. 赵杏媛, 杨威, 罗俊成等. 塔里木盆地粘土矿物. 武汉: 中国地质大学出版社, 2001, 252-253. 景民昌, 杨革联, 孙乃达. 末次间冰期-末次冰期柴达木盆地东部气候演化形式. 地球科学与环境学报, 2004, 26(3): 83-87. 樊启顺, 赖忠平, 刘向军等. 晚第四纪柴达木盆地东部古湖泊高湖面光释光年代学. 地质学报, 2010, 84(11): 1652-1660.